The Smith-Roberts home was built in 1904 on part of Block 1of the Tucker’s addition. The home was built at a unique time in American architecture when home styles were changing from Queen Anne to Colonial Revival. The home originally had 13 rooms including a music room, library and foyer. There were two fireplaces, one in the living room and one in the music room. A.J. Tucker, an early settler in Collin County, purchased the tract of 145 acres from T.T. Bradley, the grantee from the state of Texas for the said land and formed the Tucker addition out of the same. Howell E. Smith purchased lot 503 on September 24, 1904 and the home was built shortly thereafter. It has been said that Mr. Smith was a man of brilliant intellect. He served as President of the Texas Bankers Association from 1917-1918. Mr. Smith began his banking career as a cashier at the First National Bank and in 1921 was elected as the Commissioner of Insurance and Banking of Texas. That same year, Mr. Smith also became the Director of the Federal Reserve Bank of Dallas and served in that capacity until 1929. In addition to his banking ties, Mr. Smith was also one of the organizers and stockholders of the Texas Power and Light Company, serving a number of years as one of its directors. He also served as Assistant Treasurer for several years for the Texas Electric Railway Company. Mr. Smith was also a member of the Executive Committee of the Dallas Currency Association. 503 Tucker Street was occupied by the Howell E. Smith family until 1917. In 1917, Dr. W.R. Mathers bought the home from Mr. Smith and he and his family occupied it until 1938. In 1938, R.C. Roberts purchased the home from Mrs. Mathers and it was occupied by him and his wife, Emma, and their two sons, Geldon and Herbert Ray Roberts (known as Ray Roberts). High School. He attended Texas A&M University and North Texas State. In 1999, Ken and Debbie Olthouse purchased the home and sold it to the present owner, Renita Diane Browning, in February, 2013. The home was originally painted and maintained white throughout several decades. It was then painted pale celery, and is now a medium gray tone. 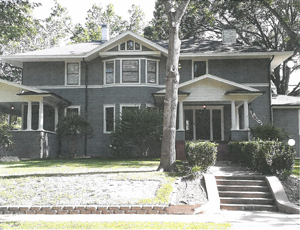 503 Tucker Street has been the location of many grand parties during its 100 plus year history. Mrs. Smith, known in McKinney society as one of the “brightest and noblest” hosted many parties and social events in the spacious home. Also included in the home’s history were many political activities and gatherings. It is said that both Presidents John F. Kennedy and Lyndon B. Johnson were guests in the home. In 2004, for the second time in the home’s history, the grand residence was on the Heritage Guild’s annual Holiday Tour of Homes. Over 1600 guests toured the home that was richly decorated for the holiday season. Presently, 503 Tucker Street is one of the many, distinguished homes that are part of the McKinney Residential Historic walking tour. The home maintains many of its original light fixtures, along with the original stained glass window in the front stairway. Additionally, the leaded and beveled glass sidelights at the front entrance are original to the home, as are the coal burning fireplaces and pocket doors off the center hall. In conclusion, the Smith-Roberts home has been well documented and preserved over the years. Its stately presence and unusual architecture makes it truly unique. Ms. Browning is passionate about historic preservation and plans to continue to preserve the home for future generations. Moreover, it is her intent to document the integrity of the house as a tribute and reminder to future generations as to the critical importance of preserving our common historical past.